Shot in the head? No Problem! Carry on! We all have nicked ourselves or scraped an elbow without noticing it, at some point in our lives. Pretty common occurrence. But it takes a special kind of man to take a bullet in the head and not notice it. For five years. Well, that’s exactly what happened to a Polish man living in Germany according to a Reuters report (http://link.reuters.com/car67n ) on Tuesday. The man, who came to about the bullet in the head only when he was about to be operated on in response to recurring pain, said he remembers receiving a blow to the head around midnight at a New Year’s party “in 2004 or 2005”! 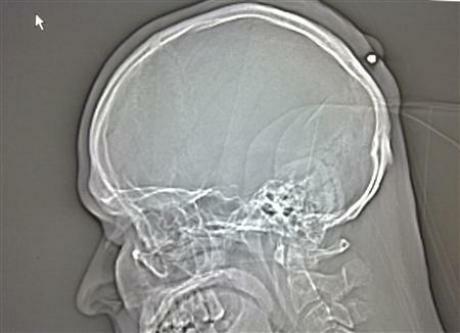 Apparently, he was too drunk to take more than casual notice of the fact that someone popped a bullet into his head! Boy that must have been one hell of a party! Fascinating as this guy is I cannot help thinking about the poor chap who did the actual shooting. Imagine what must have passed through his mind? He goes and shoots this guy in the head. Instead of rolling over and giving up the ghost in a perfectly civilised manner, the guy just gets up and goes on partying. Insane! Downright unsettling! This theory is based on what Jeeves calls “psychology of the individual”. It’s simple actually. If I shot someone in the head and the chap did not even notice. I would certainly suspect myself of having taken a shot at God or the devil. In either case I would start drinking to forget it all! Well.. well.. well .. It seems Twitter has lost it again. In the latest incident Notations for followers and the number of people/organizations one is following has vanished without trace. I am thinking, Twitter had better sort this out quickly or celebs that have sweated it out accumulating a sizeable fan following are going to be really put off if they have to go through the whole process again! Lets hope Twitter stops being such a twit! Indian Footwear Components Manufacturers Association (IFCOMA), the apex body working for the Indian Footwear Industry, has come out in support of off-duty constable Ahad Jan who threw a shoe at Jammu and Kashmir Chief Minister Omar Abdullah during the flag-hoisting ceremony on Independence Day. IFCOMA, which said the act showed that Jan’s soul/sole was in the right place, condemned authorities for arresting Jan.
“One should not judge a man based on his shoes (possibly the ones he throws at politicians),” IFCOMA President Shu Laze said in a statement. The authorities should have taken a more lenient view, especially given the fact that the shoe was flung during Independence Day celebrations, Laze said. “What good is freedom if one does not have the freedom to fling footwear,” he said. Omar himself has brushed aside the incident nonchalantly. “I think there is a positive way of looking at it. For long I have been trying to walk a mile in the shoes of the Kashmiri people so as to understand their plight. This shoe thrown at me is actually the shoe of opportunity,” He said. His father Farooq Abdullah has taken a similar view of the action. “Omar has joined the elite club of world leaders targeted with shoes,” he said. “Moreover, I approve of the incident as shoes are also renewable resources,” the Union Minister of New and Renewable Energy said. IFCOMA’s Laze said the incident goes to show the many uses that the humble shoe can be put to. “Shoes have been part of mankind’s history since 8000 BC to 7000 BC. The fact that even after 10,000 years people are still finding new and innovative uses for them is just fantastic,” he said. The incident comes on the heels (pun intended) of shoes being thrown at Home Minister P Chidambaram and more famously at the US President George Bush. 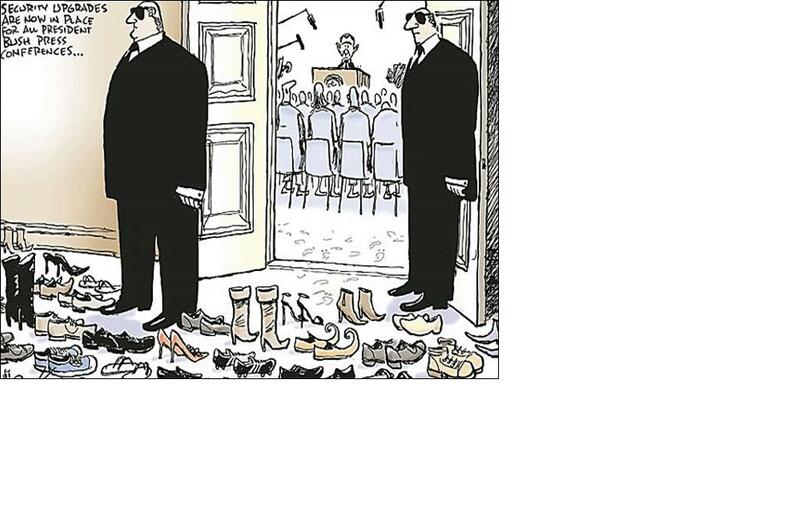 “It just shows that shoes of inferior make were used. We are now designing shoes with special ballistic design for more accurate throwing,” he said. Market chatter has it that top shoe makers Reebok and Adidas are closely studying the situation to see if there is any possibility of branding and advertisement in future shoe throwing incidents.